The preferred choice of professional magicians, our big card is 50% larger than standard poker. 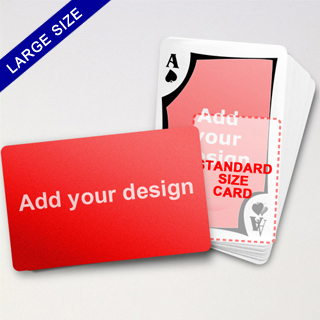 Spectators can therefore see the cards and read those indices in a reasonable distance. To align with your own style, nature and/or theme of the show, customize the deck with different emblems, images or pictures. The seemingly subtle yet remarkable gesture impresses guests and shows your professionalism. Don’t forget to order a few extra decks to treat your fans. This makes you a charming great performer.